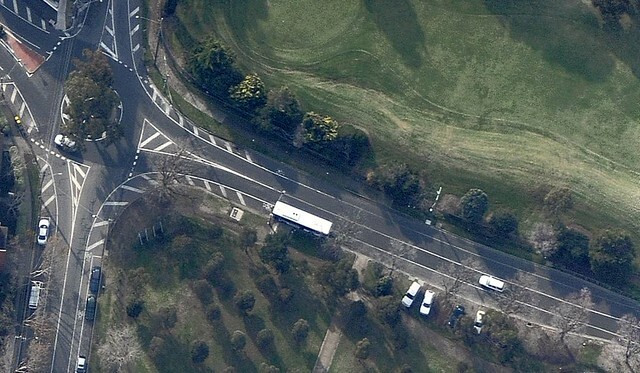 This is where one of Melbourne’s busiest buses terminates. The 630, in the middle of Elsternwick Park, between the skate park* and the golf course, and blocking the westbound bike lane. The closest shops are a few hundred metres away. It’s 800 metres (as the crow flies) to the nearest railway station, and the bustling centre of St Kilda is about 2km away. Those would all be useful places for a bus to terminate, bus no, this one runs via quiet suburban streets and finishes in the middle of a park. It’s about as close to the middle of nowhere as you can get in the inner suburbs. Why does it finish there? It has done for years, more-or-less. Once upon a time it went to the beach nearby, but got switched to the park a few years ago. Consequently the Elwood end of the bus route is very quiet (not a good use of taxpayer-funded resources) — while the other end is so busy it’s become infamous among Monash Uni Clayton students for its overcrowding. If only they had a process to fix things like this. They do. The Metropolitan Bus Service Reviews were initiated to identify problems like this, to get community input, study the possible fixes, and recommend solutions. The Bus Service Review recommended that this bus route be extended 2km to St Kilda, so it would provide a useful link from St Kilda to Monash Clayton, as well as better provide for local trips in Elwood, be more useful for passengers, pick up more patronage, and be more cost-effective. Other nearby routes would also be optimised (including the way confusing 600/922/923 route). The problem? Only a fraction of the changes recommended have actually happened. This is one of many recommendations right across Melbourne which have been ignored by the government. So for now, the 630 continues to terminate in the middle of nowhere. *The same skate park where a few years ago, some idiots destroyed a VCR. Good example of silly bus route (or part route). Nice picture, too! Almost none of the recommendations in the Bayside/Kingston review have or (it appears) will be implemented. If you think *that* the middle of nowhere, you ought to go to the Gentbrugge tram terminus in, well, Gent. Tram route 22 terminates (or did; I’ve not been for some years) **literally** in the middle of nowhere, beneath a motorway bridge in the inner suburbs. I’m not even sure the point was accessible, except by tram. It was busy whenever I went but that was because I was accompanied by 50 other tram enthusiasts on a tour! I, too, participated in those bus meetings. Mine were in the Knox/Maroondah/Yarra Ranges area. And I also found the representative from the local bus company to be interested only in what he and his company could gain. When I suggested that a rail service be extended by a few kilometres, he laughed off the suggestion because he wanted to protect the business his company gets from operating a pathetic service along the same route. I think this kind of attitude could be subverted quite effectively, to the benefit of the public, if the public transport system was co-ordinated properly by a government department (which it is not). Philip – you’ve summed it up right there. An overhaul of the current Department of Transport is what is needed. Give it a new name, a new face, new responsibilities. One department that plans and coordinates all routes, all time tables and all fairs across the whole network, not just buses. The current Department is too large and there is obviously too much bureaucracy going on. What we need is a smaller Department with more expertise. This is par for the course when you can’t get a train to Melbourne on a Sunday before 8am, when buses are cut back for the Whittlesea show (yes, filed formal complaints, still no explanation) and when Monash Council quietly bans buses from the Hanover Street Bridge (due to structural repairs) but fails to notify commuters of the change of bus stop (yet trucks are still merrily using the bridge). There’s an article here about old rail aligments and their value that has some relevance to running buses on ‘old alignments’ when their may be signficant gains from moving to new routes. Also, simply changing the route should cost very little (a few bus signs); service span and frequency improvements could be added later when money is available. Route changes may even improve the budgetary situation if the new route attracts more riders for the same number of kilometres driven. Even any newly constructed routes seems to end in the middle of nowhere. New Route 709 will be a prime example of that! The bus will terminate at the Waterways estate with a 16min turnaround before heading back to Mordialloc. Simply extended it further to more useful points such as the nearby Aspendale Gardens is more effective. Better yet, combining it with Route 858 would make better use than of an existing service that also ends in the middle of nowhere (idling there for 9 mins mind you), which already has a confusing destination of Aspendale Gardens that merely just stops on the border of the suburb, rather than pass through it.